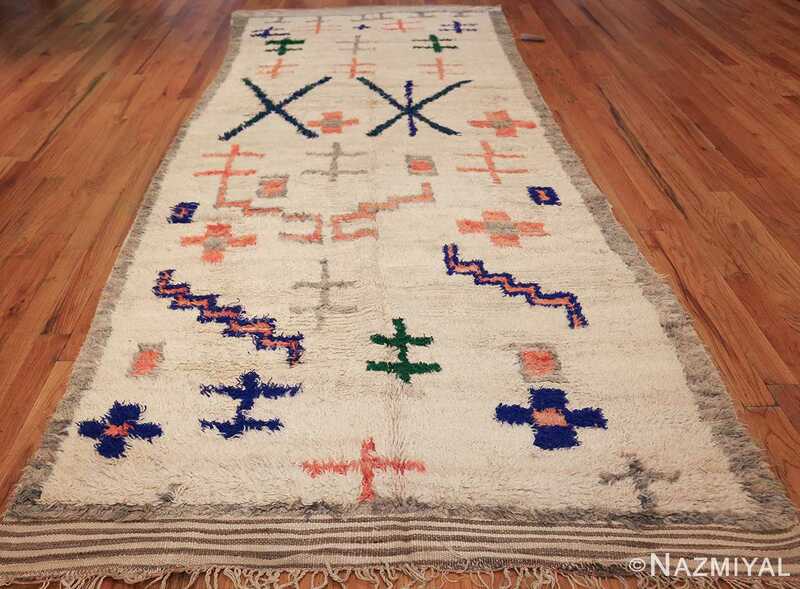 Beautiful And Tribal Vintage Shag Berber Moroccan Rug, Morocco, Circa: Mid-20th Century – Boldly colored ancient symbols create a one of a kind treasure in this mid 20th century vintage Moroccan rug. The vintage carpets created by the Moroccan Berber tribe cultures found their way into mid 20th century design collections alongside the works of contemporary abstract modern art and expressionists of the time. 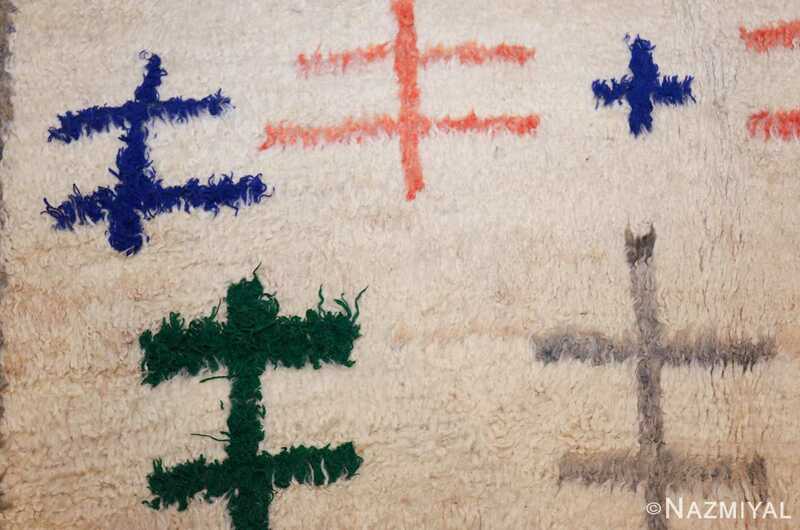 Each of the design symbols in the Moroccan shag rug has a special meaning for the weaver. 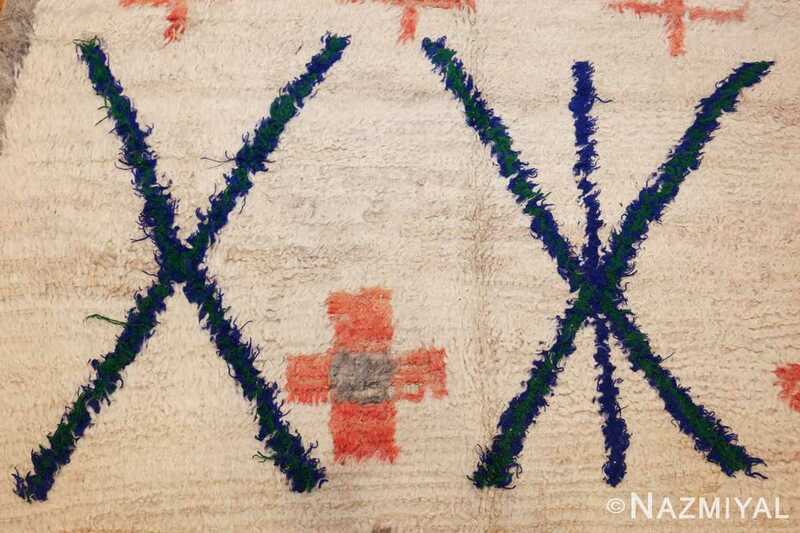 The Berber rug weavers create a primitive language that tells the stories of the person who created it. Perhaps even legends or folklore stories from tribal cultures, or represent elements of the natural world surrounding them. 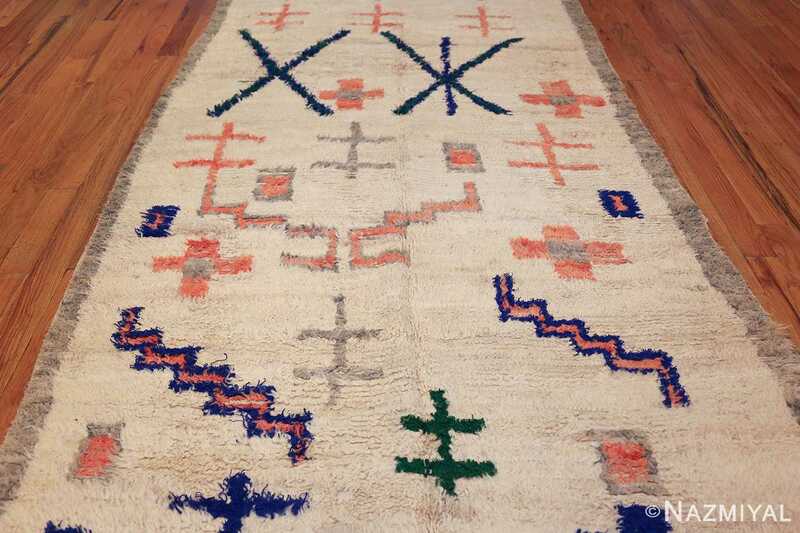 This vintage shag rug does not have symmetry in either direction, and yet the artist created shapes within the overall design that lead the eye through the design elements. 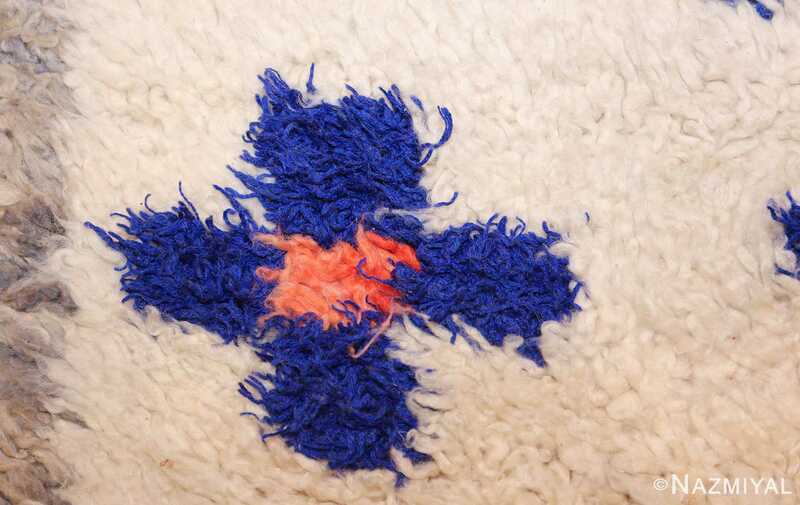 The solid soft gray border adds a neutral point of contrast among the other brightly jewel tone colored symbols. It also serves as a formal border that contains the design, which appears to extend out of the field and continue on for an undetermined time. This gray border helps to define the space and give this tribal vintage shag Berber Moroccan rug a feeling of cohesiveness as well as unity. 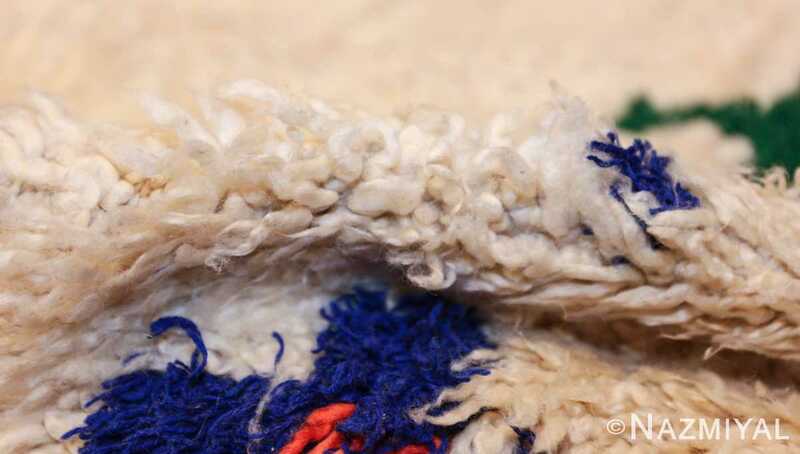 The pure color tones of the blue, coral, green and gray stand out against the natural cream wool background. 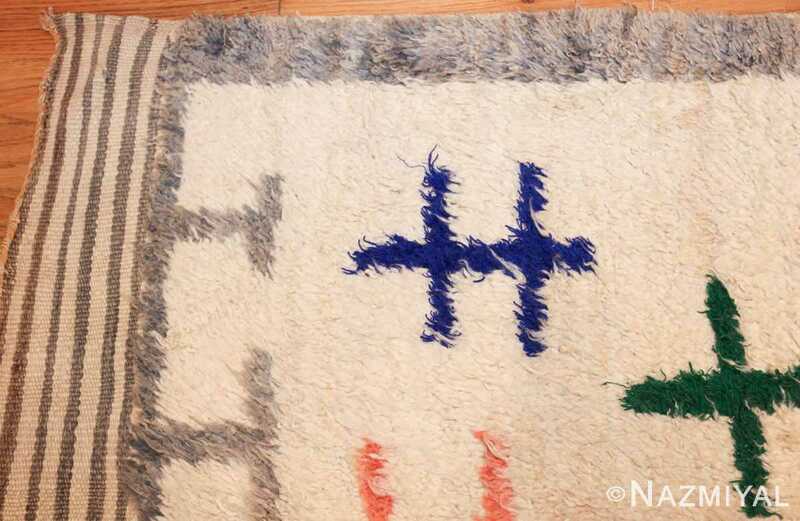 The color palette chosen and the simple shapes give it a playful, childlike quality that would work well in any modern contemporary design. 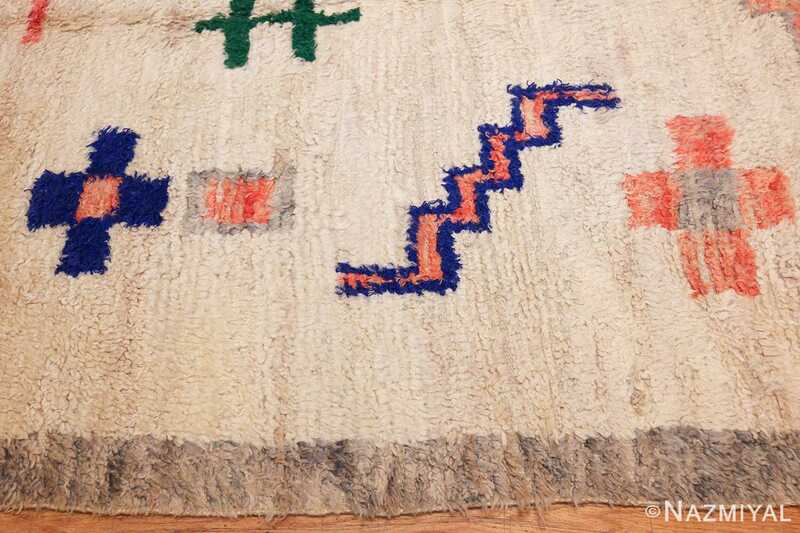 This tribal vintage shag Berber Moroccan rug is a unique piece and a fine example of mid century Moroccan art. It is easy to see how vintage Moroccan rugs fit into the ideology of mid century interior. 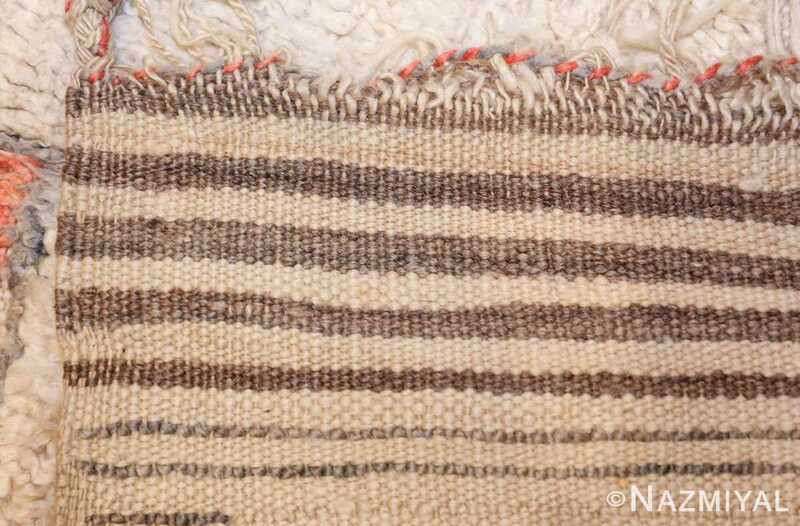 This rug would make an excellent addition to minimalist or modern Scandinavian design as well. It is versatile and adds a fun and unexpected element to any interior design.